Nov 18th We’re In Mystery Scene Magazine! by Ramona DeFelice Long, ed. 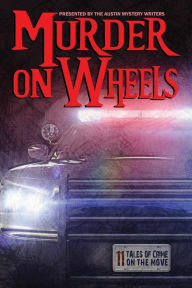 Being a Texan, I feel it’s only right for me to recommend Murder on Wheels, presented by the Austin Mystery Writers. Kaye George explains in her introduction that the genesis of the anthology was a discussion of a Megabus trip, and “The Wheels on the Bus Go Round and Round,” one of her two stories in the book, is an ingenious investigation of that setting. The remaining ten stories all involve transportation, mostly wheeled, although V. P. Chandler’s “Rota Fortunae” is set on a sailing ship in the 18th century. The name of the ship that provides the story’s title means “wheel of fate,” however, so it certainly fits. “Red’s White F-150 Blues” by Scott Montgomery is a wild story of the things that can go wrong when you do a favor for a friend. Reavis Wortham spins a compact yarn about a “Family Business” that spans decades. “Mome Rath, My Sweet” by Gale Albright is a mash-up of Alice in Wonderland and a hardboiled PI novel, which gives Hollywood PI Jake Grimm a tough case, but then he’s just the guy to solve it. Earl Staggs is a man who knows school buses, and “Dead Man on a School Bus” makes use of that knowledge with his story’s unusual setting. The other stories here will all keep you entertained as they roll along. Posted in Review by VP with no comments yet.